This product is featured in: CZ 455 American STS .22 LR. The CZ .22 rimfire is probably the most widely used and well respected .22 rimfire rifle in the UK today. It is excellent for vermin control, but it has always had an Achilles heel, namely its trigger mechanism. It was considered bomb-proof, but it lacked adjustability and finesse. But now the new 453 model utilises a set trigger unit, whereby a standard trigger pull can be transformed into a light instant release simply by pushing forward on the trigger blade. The high level of accuracy that we have come to enjoy from CZ rifles has been retained, but the Varmint model, as its name suggests, sports a heavier barrel profile combined with a 16in length for ease of fitting a sound moderator, and all bedded into a sturdy, varmint-style walnut stock. This might just be the best-value .22 rimfire on the market today, but a field test will confirm or reject that. CZ offers a diverse range of stock styles for its rimfire rifle range, with laminated thumbhole designs, standard beech, elegant walnut and, as on this model, a heavier Varmint profile stock. This is a no-frills walnut stock with a straight comb for scope use and a wider and deeper fore-end to accommodate the heavier barrel, while also giving a more stable platform either to hold or when using a bipod. The model tested had a plain figure and bland colouring, but I have seen some lovely walnut used on other CZ rifles. There is a solid black rubber recoil pad that really grips the shoulder when mounted, but this Varmint model does not have any chequering on either the pistol grip or the fore-end and this, combined with the heavy matt lacquered finish, makes it a bit slippery in the hand. There is no bedding between the action and the stock inletting, but the fit is actually very good and certainly helped with the impressive accuracy that the CZ 453 showed in the tests. What can I say about the CZ action that has not been said many times before? What you have is a perfectly crafted and scaled-down Mausertype action designed specifically to handle rimfire rounds, whether .17 Mach 2, .22 LR, .17 HMR or .22 WMR. The receiver is all steel and of tubular construction, with a matt black bluing on this Varmint model. The top of the receiver has the dovetails cut into it so a scope can be fitted directly to it ? lower than if you use separate bases and mounts. The bolt itself is similarly well built, with a twin extractor claw arrangement and a fixed blade ejector that sits in the action and flips cases out when the bolt is retracted. The magazine is polymer in construction, which saves weight and is meant to feed better if it gets dirty, as well as being less likely to rust. The standard is a five-shot, but a 10-shot magazine is also available, which is very handy on lamping trips for rabbits where the shooting can be fast and furious. The barrel is a heavier profile Varmint model, giving stability to the rifle and, with its short 16in length, is ideally suited to hunting from a hold in the shoulder or off a bipod. The muzzle is screw-cut for the usual 1⁄2in fine (UNF) thread, and so a sound moderator can easily be fitted without increasing the overall length of the CZ too much, due to its short barrel. Again, it has a matt black finish that is unlike the highly polished blue on the American model, but this makes it better suited to hunting, as it minimises unwanted reflections off its surface, thereby helping to conceal the hunter?s presence. The safety catch remains the same wing-type, activated lever sited on the rear bolt shroud, which has not changed for decades, but still offers a direct and positive safety feature to disable the rifle from firing. When it is at right angles to the bolt, it is in the fire mode and a red dot can be seen on the side of the action. Pushing the catch forward activates the safety and the red indication dot is covered by the lever, thus telling the shooter that the rifle is safe. The safety can only be set when the action is cocked, and it then locks the whole bolt mechanism so the bolt handle cannot move. However, this is where the similarity with the older models ends, as CZ has wisely upped its game by fitting a better trigger release mechanism on this 453 model. In standard mode ? with direct trigger pull ? as usual, the trigger blade releases the sear at around 5lb with a small amount of creep. This is fine, but to enhance the accuracy potential with a smoother trigger release, the trigger blade can be pushed forward by 1⁄4in, which activates the set trigger feature. The smallest pressure ? less than 1lb on this rifle ? will trip the sear and send the firing pin on its way through the bolt to connect with the rim of the cartridge. The CZ Varmint 453 really liked the RWS subsonic loads. 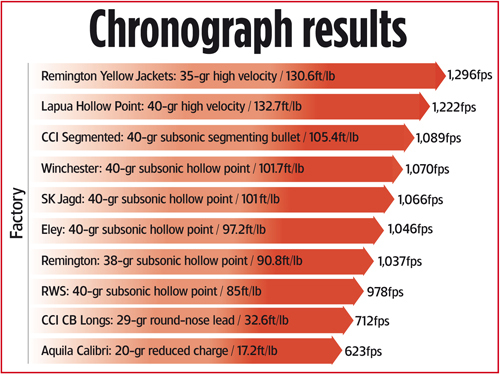 It shot 1⁄2in groups at 50 yards consistently and, because the velocity was lower than most of the other standard subsonic loads, it sounded quieter, too. 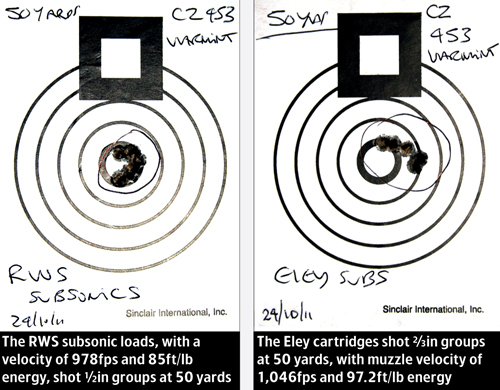 I find that Eley cartridges always shoot well and I shot 2⁄3in groups at 50 yards, making it a great rabbit load. The Winchester and SK Jagd (Old Lapua subsonic load) both shot 3⁄4in groups, while the CCI segmenting ammunition grouped into 9⁄10in at 50 yards. I tested a couple of high-velocity Remington and Lapua loads, but really this is a subsonic rifle, though the Lapuas gave tiny 2⁄3in groups, while the Remington could only shoot 1in. Finally, I used a couple of reduced loads. The CCI CB long was accurate at 20 yards, with 1⁄2in groups at 712fps velocity and 32.6ft/lb energy, so with little risk of ricochets. The Calibri is no longer available, but is quiet and useful for pest control. CZ rimfires always shoot well and this 453 was no exception. 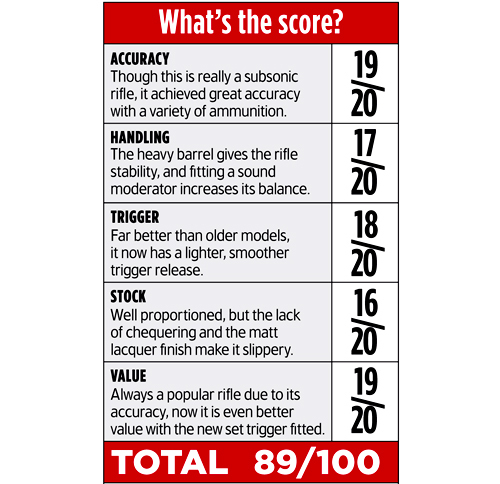 The upgraded trigger mechanism has improved the accuracy and transformed the rifle?s feel and firing cycle. The shorter barrel is sensible, as most people will fit a moderator, though the stock could do with some chequering. The CZ 453 offers value for money and is a great choice as a vermin tool.